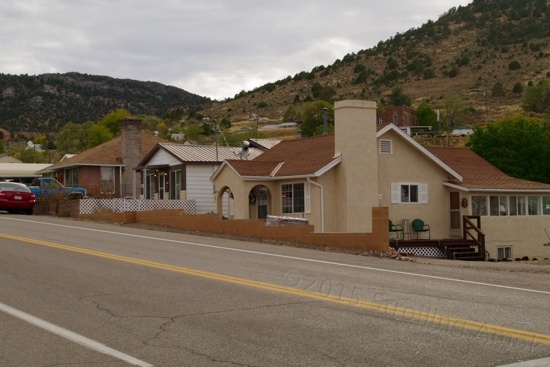 If you’re driving about in sprawling suburbia and want a change of pace, like something to readjust your familiar assumptions that the entire world consists of huge malls connected by long strings of badly-timed traffic lights, Pioche is just the cure. I counted just one traffic light in town, and that was a single yellow caution light at one four-way intersection – and that wasn’t blinking because it wasn’t turned on. There’s also one yield sign downtown. Pioche tends to use those instead of stop signs. In the downtown area, unmarked diagonal parking is the rule, and long pickups like the Mighty Furd stick out into the two-lane Main Street, A.K.A. Business Route 93. No matter – cars idle around easily, since traffic here is defined by one or two cars, with nothing in sight in the opposing lane. There are no crosswalks – you saunter where you need to, in order to get where you want to get to. A mine on the outskirts of town. It’s hard for me to imagine the drop, but I’ve read that they hit water at 2,100′ down, and had no practical way to pump it out. Today, it’s a question of will and money. 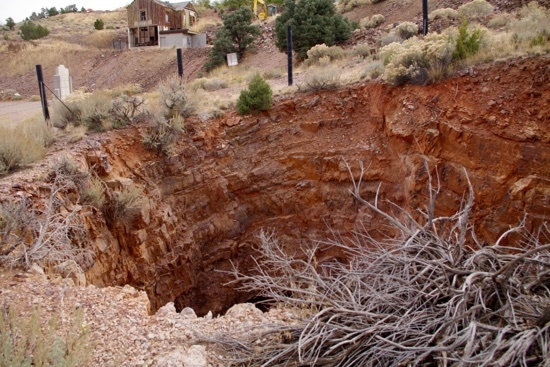 Pioche pretty much started rolling when silver was found there in 1864. 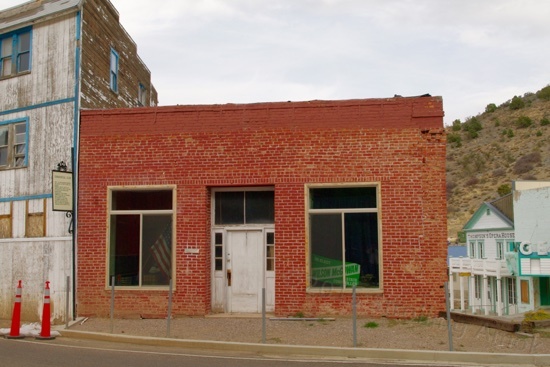 At that time, it was part of the Utah Territory, and when the border with the Nevada Territory was later moved, Pioche came with it. Didn’t matter much, since Pioche remained in the middle of nowhere. Its remoteness attracted opportunists along with the miners. In those days, it was sink or swim. If you could not find a way to put food on the table, you starved, so wandering out West was no picnic. Things in the East were often tough, what with streams of immigrants overwhelming the supply of available jobs. People headed west because of the potential of finding land that could be harnessed to support them, or perhaps minerals that could be sold to make them rich. A new life. Unfortunately, criminal types also recognized the budding opportunities to live like parasites off of those trying to make a living, and the more remote the location, the less law imposed on their behaviors. People who have no sense of accountability act only a notch or two worse than those whose innate misbehavior is endorsed by policy. They are freelancers, of a sort. 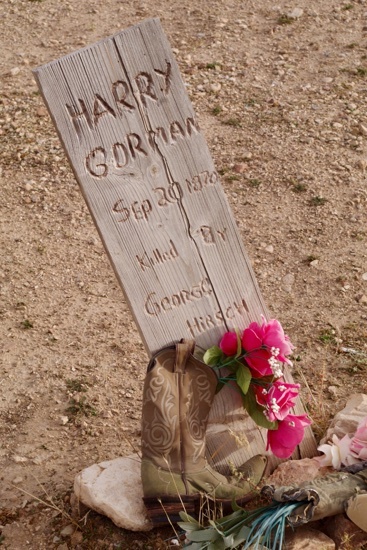 Boot Hill includes a row of souls murdered around 1870. Those apprehended are allegedly scattered about elsewhere in about 100 unmarked graves, which I understandably could not locate. This is often referred to as “Murderer’s Row” online, but the markers here clearly indicate that these are the victims on or about just one year. Tombstone? Rank amateurs. 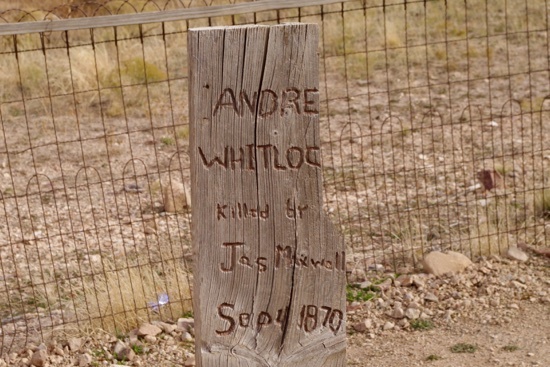 Pioche counted its murders by the score each year. 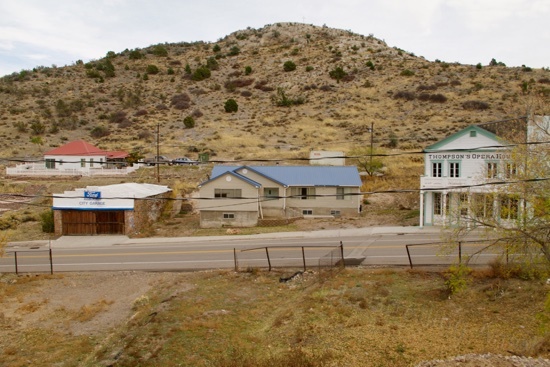 Pioche was named for its benefactor, a Frenchman who took full advantage of the Land of Opportunity to become very wealthy by means of banking and land speculation. Unlike most such entrepreneurs of the time, his conduct appears to have been largely above board, and he had a philanthropic bent as well as a justifiable enthusiasm for the West. Unfortunately, when he overextended his holdings and economic ups and downs took their effects, he put a gun to his head to solve his problems. Long before that point however, Pioche pretty much resembled an unsupervised schoolyard packed with lethal bullies. 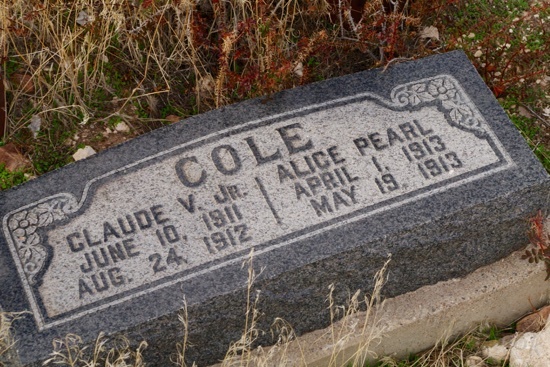 The perception at the time was that over seventy people died of rapid lead poisoning before a single one could have the luxury of dying from natural causes. True or not, the point was made. Without the threat of law enforcement or legal investigation and punishment, murder became the norm, and when possible, so did retribution. 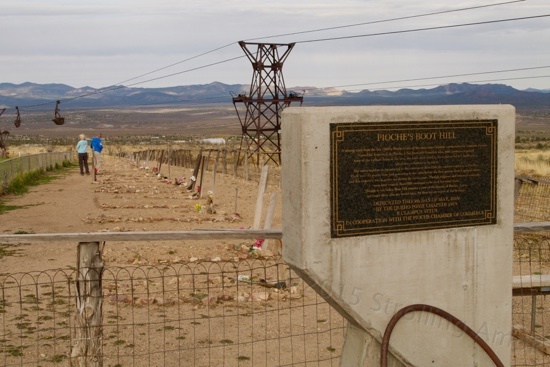 Not a pretty story, but one reflective look at Pioche even today explains its distant history. It’s a hard-tack little town in that’s relatively out of reach of everything. Supplies are hard to come by, its 6,000’ elevation guarantees difficult winters, and there’s a sense of it being more of an outpost than a town. 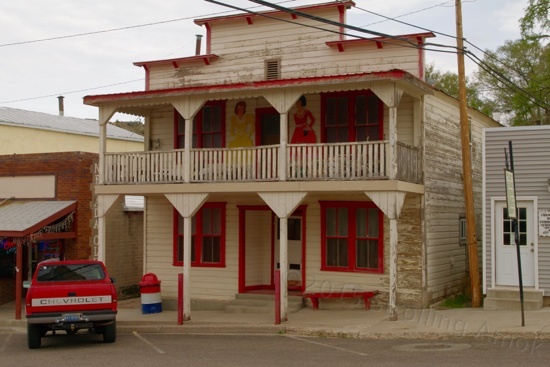 This hotel and saloon is the preferred place to spend the night in such a historical mining town. 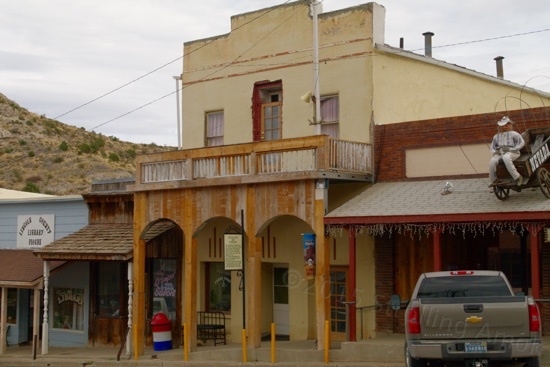 How it has managed to avoid becoming a ghost town is hard to discern, except that a good chunk of its population simply refuses to give up and leave. 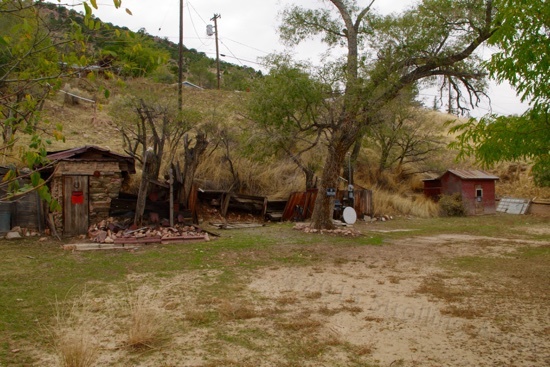 Pioche contained 6,000-7,000 people in its heyday, depending on which account you read. 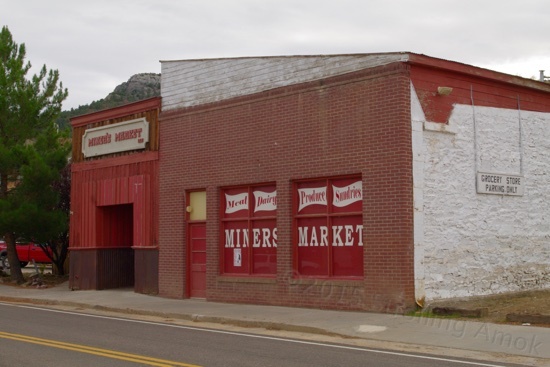 By 1900, the silver had played out and the place was practically a ghost town, but mining for different ores useful to industry began to pick up, and a portion of the hustle returned to Pioche in a more organized form. By the 1920s, things hopped along nicely, peaked during WWII, and finally played out in the 1950s. I think that it’s worthwhile to mention here that what we view today as the wasteful plundering of the various resources of the West was at that time viewed as using them to their best advantage. The vast infrastructure of the East needed feeding, even down to the ever-changing fashion dictates in the larger cities like New York and Boston. Thus the forests were cleared of fur and feather-bearing creatures by mountain men first, then of trees. The grasslands of the vast plains awaited being plowed under for raising grain and cattle. It was all there for the taking in unfathomable quantities. The common attitude was that anything not yet harnessed and put to use answering the people’s needs (and lining pockets) was a literal “wasteland” so long as it lay undeveloped. In fact, the man who successfully lobbied the Federal government to legally abscond with area water rights to supply the new city of Los Angeles viewed Teddy Roosevelt’s protection of Yellowstone as an absurd enforcement of utter waste. Surely people would admire and benefit from a dam across it more than merely gazing at any waterfall. Even today, our ecological preservation tendencies are understandably limited by the potential to earn a living. I am continually surprised that the state of Colorado, which pretty much came into being solely due to mining barons and even used the state militia to exterminate striking miners and their families, has evolved into a sort of Mini-California in all respects – except mining. There, you can poison the drinking water supply for hundreds of miles around with little more than a “sorry for the inconvenience”. There doesn’t seem to be much public outcry, since no mining = no jobs. No mining = radically reduced state government income from a host of sources. We tend to see preservation through a financial filter, so we need to be careful about turning our noses up at those unenlightened barbarians of the past. When push comes to shove on an individual basis, us is still them. 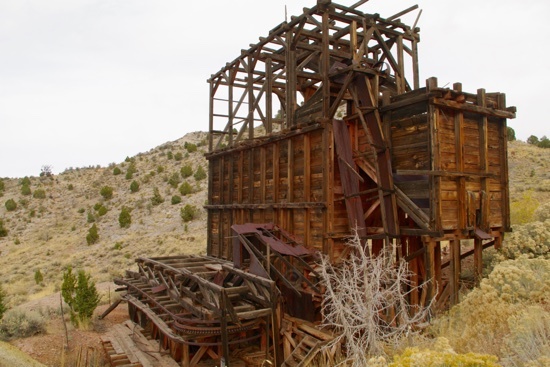 The Pioche Aerial Tramway carried ore out in cable-supported buckets (left center) to a distant mill. Hard to believe, but it needed only a 5 HP electric motor to get it going when the outgoing buckets were full. With full buckets, overall slope kept it rolling on its own. This was in operation throughout the 1920s and 1930s. 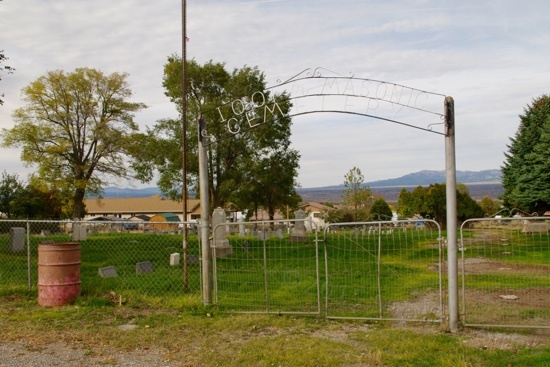 Pioche’s more recent population is difficult to discern from poorly-resourced data, but it appears to have been under 800 souls in the year 2000, rose to 1,000 by 2010, and returned to its earlier level by 2014. Looking at its recent losses of critical support businesses like banking and groceries, no hardware, auto parts, clothing or general department stores, and only the most rudimentary auto repair facilities, I have to think that the impracticability of living there will prompt a further exodus. The only healthy businesses appear to be two bars, of course. 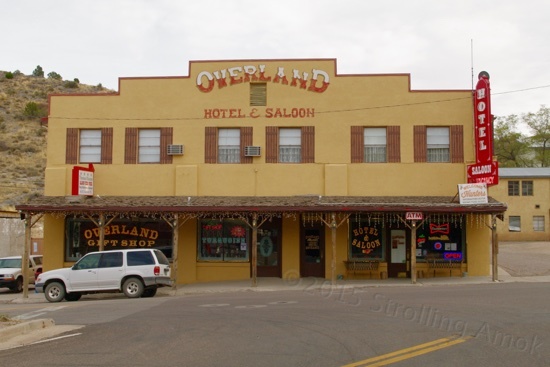 A couple of gas stations also qualify, as well as a historical hotel/bar/gift shop catering to tourists. A jeweler is still kicking, somehow. And a small restaurant is still viable but is up for sale by its owner, as a telling indicator of which way things are going. Everyone else still technically in business has been relegated to operating hobby businesses with very limited day/hours that do not impose much of a burden or conflict with day jobs. 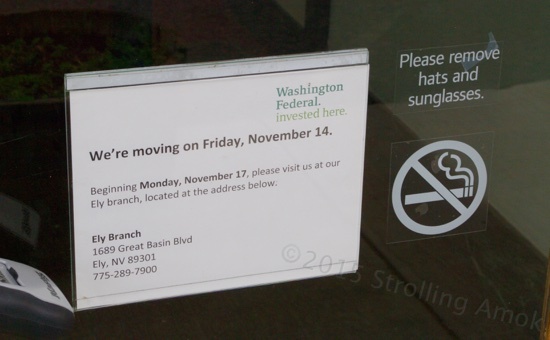 The remaining businesses, I’d guess about half of the total, are defunct, whether empty or still stocked with items. Yet no properties other than the live restaurant have for sale signs on them. By appearance, the owners of many seem to be waiting for better times. Many residences have been abandoned and left for dead, yet again, only a couple of for sale signs are out. 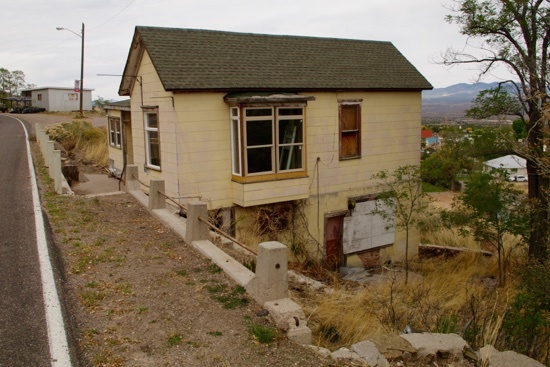 Many others are in very poor shape and are unoccupied, but show signs of being in the midst of rehabbing. Many have vacant spaces for RVs, indicating only seasonal occupancy. 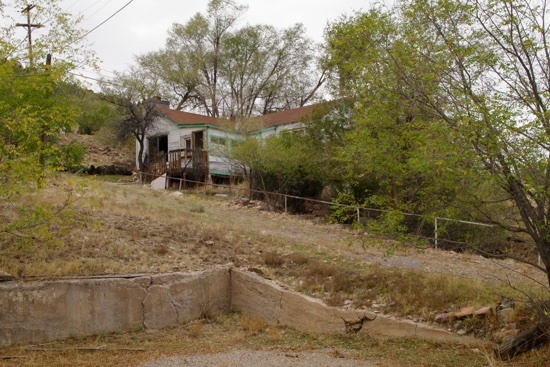 Here’s a “vacant” property along a main drag that has a power box and water supply for an RV at center, and a shack-covered mineshaft at each end! Rockhounds Gone Wild! Yet at the same time, my tour showed one guy out completing his new home, built from scratch, pretty stained wood, and modestly-sized. Most homes are fairly compact, older structures placed close to each other because of the limitations of the surrounding terrain. A telling feature of the age of the town is the rarity of driveways alongside houses. This isn’t from mere small parcel sizes, but is a result of the town being laid out in its boom times, which happened long before the advent of the automobile (especially it’s appearance here) and the complete absence of any need to commute elsewhere for employment. Who would need an automobile to cover what is a twenty-minute walk, at most? Any thinking person would live next to where they worked. For that matter, who would need the even higher expense of keeping a horse, with buggy or wagon in such a compact town? Where would the space for a stable come from? What would be the point? People didn’t load up on seventy pounds of groceries at a time, they bought what they needed for a day or two, as fresh as they could get it, and carried it home. Big items were delivered by the store. Everything they could possibly need was right up the street. The tendency was for everyman to walk, and for commercial enterprises to need the transport and be able to covers its costs. So naturally, the homes here are small, clustered together in spaces that the sloping ground allows, and close to downtown. It may be hard for us today to conceive of a world that does not revolve around the automobile, but at one time, a town’s layout revolved around people, water, waste, closely-accessible stores offering products and services and, ideally, main streets having enough width to allow turning a horse and wagon around to head back out the way they came. 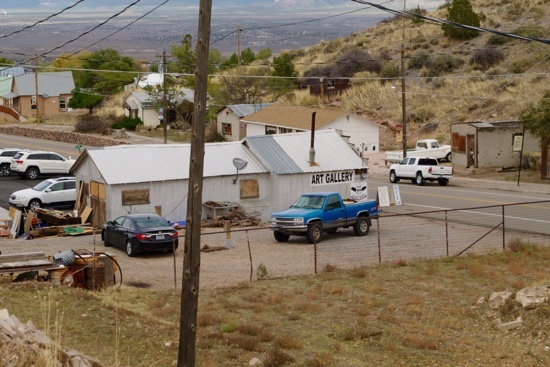 That’s one of the tiny treasures of places like Pioche, where you look around and maybe half an hour later, realize “Hey, how come none of these places has a driveway and a garage? That’s really odd!” Too late to add them now! Here’s an interesting home that’s being rehabbed, right alongside Business 93. No access to speak of in back, and the only place to park up front is a pull-off further ahead. Not the easiest, cleanest rehab job you’ll ever see. And, considering that keeping a home warm through bitterly cold winters was no mean feat, size worked against you. Bigger meant more stoves and fireplaces, with attendant expenses, and for what? How much room do you need to live comfortably, really? Beds, table, chairs, kitchen, and maybe a room big enough to seat the people dropping by. What would your life then need to center around if you had more space than you really needed? Just as the automobile has completely redefined cities, towns, where we live and how we live since about 1920, the advent of the furnace and the fuels that fire it has redefined what we live in. I have a sneaking suspicion that while our transplant to the functional past might be initially accompanied with a sense of hardship and deprivation, a citizen of early Pioche transplanted to our ways of life today would be overwhelmed by both the modern conveniences, along with a great deal of deep confusion about exactly how this sums up as slam-dunk superior. They would immediately spot the trade-offs, while we remain unaware that such ever existed. No aspect of what they would gravitate toward building for themselves would be permitted today, and there’s the rub. What we view as adhering to minimum acceptable standards would be to them an unthinkable encroachment of their most basic freedoms as citizens. Different time, different culture, different perceptions, different values. My own perception is that “progress” is a trade, not a pure gain. Yup, that’s the Aerial Tramway, once hauling buckets of ore right through the graveyard after it had been there some 60 years. An affront in anything but a mining town, I guess. 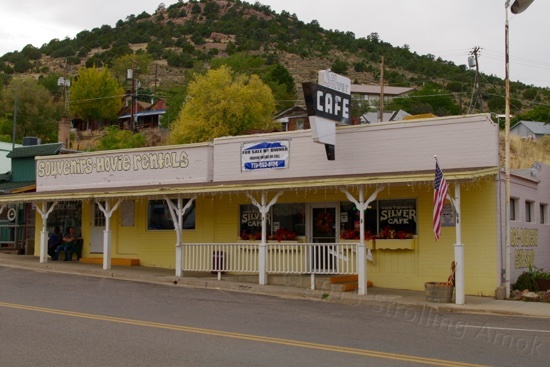 Pioche is worth it for the average drive-through tourist, thanks to the authentically-themed hotel, the eclectic nature of the town, its county museum, Boot Hill, the abandoned mines and mining equipment, and the preserved architecture. For a camper like myself, it’s a joining of extremes. The town itself is not to be missed, impressively rich in history, and altered only a little by time and modern needs. On the other hand, you can be here only as long as you are provisioned for. Propane refills, or food more sophisticated than cans of chili, frozen pizza and burritos are 25 miles away. You can eat and drink to your heart’s content downtown, but you’d better be budgeted for that extravagance. Food is not cheap. 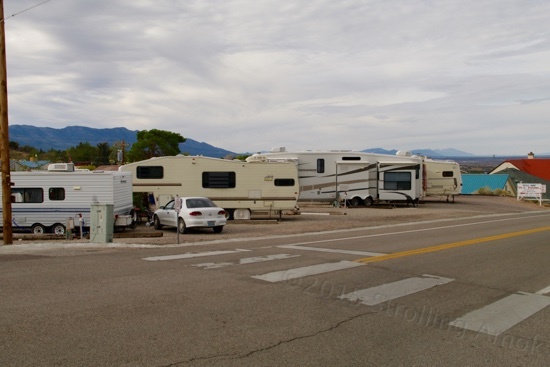 One tiny and one small commercial RV park are right in town for $20/day and up, and the city maintains a donation campground on its southeast edge offering water and sewer hookups only. Trees wipe out much of a rooftop solar installation’s output there, but it’s workable if your system can deal with it. Based on the town’s dire straights and its genuine welcome of visitors, I’ll find it most difficult to stiff them on that donation box when I depart. Not too many burgs still offer “free” places to camp any more, and this one is most deserving of anything that a budget-restricted visitor can cough up. I did see a couple of massive motorhomes with toads and trailers parked in a pull-off a few miles north of town off 93, so that is one option, I suppose. 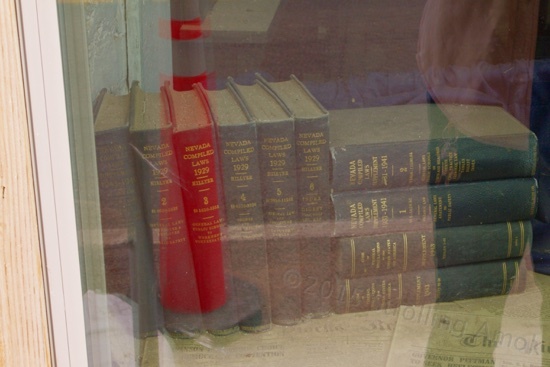 An old American flag and s set of Nevada Compiled Laws from 1929 and 1931-1941 sit in the window of an abandoned office. 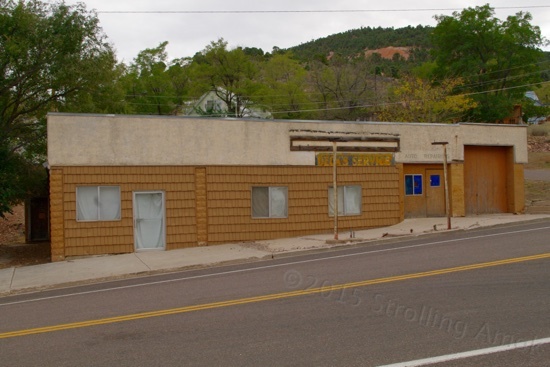 From the location of signage, the brick building on the extreme right was built in 1864-65 as the Pioche Commercial Club, a sort of social center. The wood building next to it was built in 1929 to house a fire truck acquired in 1928, and served for 25 years. (The modest center vehicle entrance is not at all unusual for that time period.) 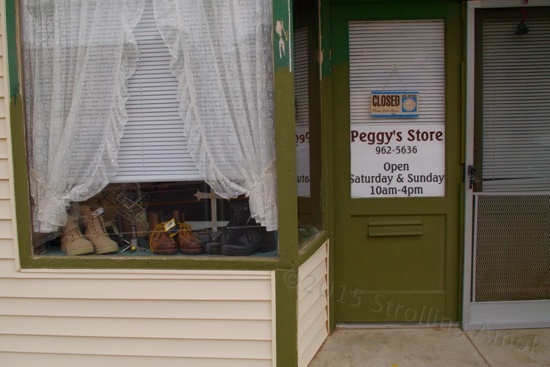 Converted to business usage, it is now marked with defunct window signage for a dentist and a shoemaker. Best guess: the “fire house” at left was added later to house a second vehicle or equipment. 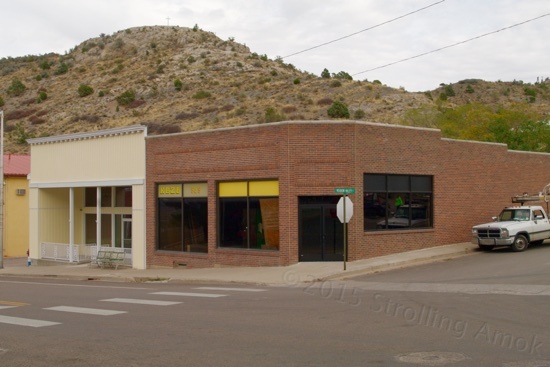 Nearly all buildings in town swapped businesses and functions as the years progressed. Here’s that Commercial Club building, which survived an early fire and a few bullets. 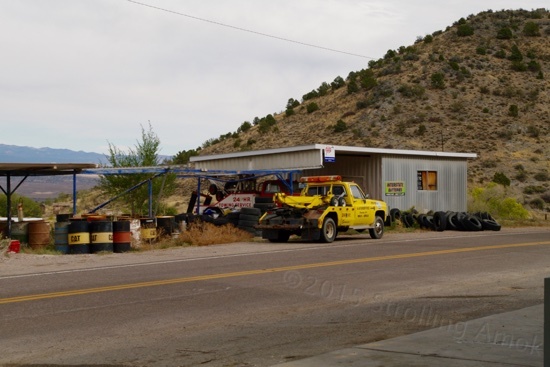 Unless you’re driving vintage, you really don’t want to have serious car trouble in Pioche. Closed two years ago, leaving the sole food source as the mini-mart inside Tilly’s gas station. I have to think that the Gem movie theater subsumed the Thompson’s Opera House, though that firewall projecting out of the roof throws me off a little. Today, the House is a tourist center, closed for the season, so I’ll never know. A Mason’s Lodge dating from 1872, and its more modern add-on to the right. People in the 1800s were very big on fraternal organizations and secret societies, the Masons being the highest profile but not the biggest. Changing outlooks, expectations and lack of time has taken its toll since then. I suspect that a records search at the county assessor’s office would be interesting. None of these abandoned homes are for sale, so what gives? At least it has a driveway of sorts, but without any level section to park on. 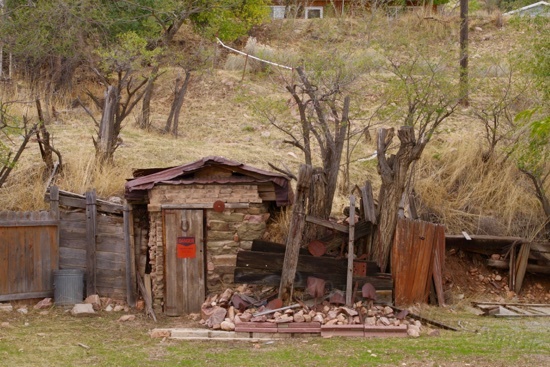 A miner’s shack, most likely guarding a hole. The Ely Valley Mines built the Mountain View Hotel in 1895, and being right next to the courthouse, housed Herbert Hoover in 1930, senators, governors and writers at one time or another. No word on when the Hotel closed its doors, but it was likely when the courthouse was condemned in 1936. 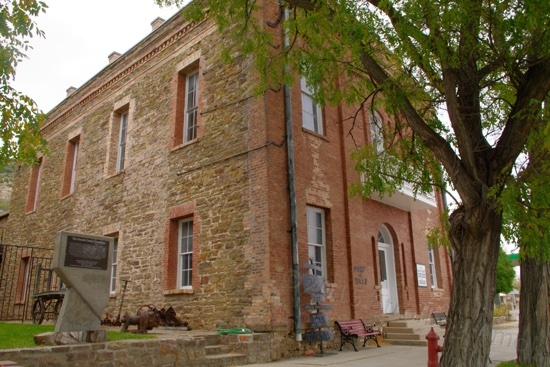 In 1871, Pioche became the county seat, and this courthouse was designed in 1872, budgeted for $26,400. Ain’t much detail on what went wrong, but the original contract was broken, and what replaced it wound up costing $75,000, paid by issuing bonds. New bonds were issued to pay for the old, and by the 1880s, the county tried unsuccessfully to repudiate the bonds. 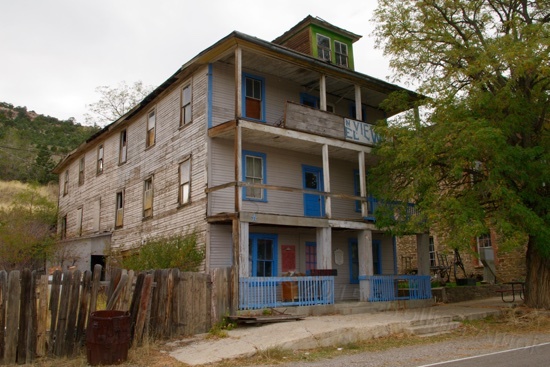 Nevada law in 1907 began a series of machinations that wound up boosting the debt to $800,000, and that was not paid off until 1938, two years after the building was condemned as uninhabitable. Thus, it today is called “The Million-Dollar Courthouse”. Not all the houses are shacks, of course. Metal roofs are big here, indicating what the annual weather does to shingles. The back of this art gallery shows a popular trend in this town: windows boarded up, one after another, even in buildings still in use. This cafe/bakery dates back to 1907. Its young owner has apparently decided it’s time to bail. Well, thanks a pantload, Chet! 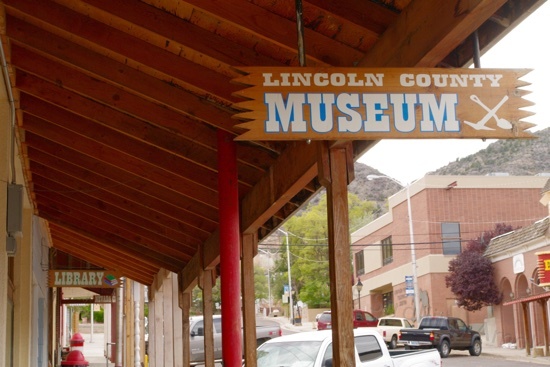 This free museum contains artifacts such as the tools, pedal-operated drill and portable chair carried by an itinerant dentist making the rounds in this area. Most of the shops are open when they choose to be, or not at all. This dead auto repair place right in town looked like it had a good time while it lasted. 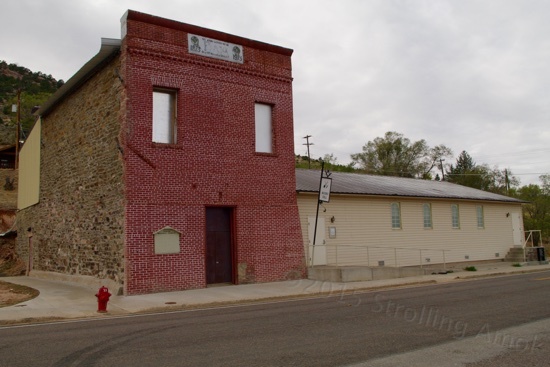 This building went up in 1872 and has been used by the Odd Fellows fraternal group since 1876. The Independent Order of Odd Fellows began in 1819 after separating from the much, much older British Oddfellows then. It is largely a philanthropic group. This lodge joined with the local masons to form their very own cemetery next to the city’s, just to give you an idea of how identity worked back then. 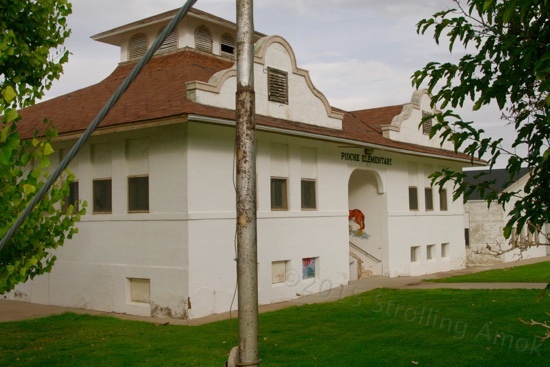 The Pioche Elementary School, built in 1909 and, apart from more boards in windows, is still in service today. The mission-style architecture is said to reflect the area’s heritage (as a land grab from Mexico), but it strikes me more as having a forced, awkward, reinterpreted look. It’s a whale, and believe it or not, for some reason it makes me uneasy to be near it. Perhaps my mother was frightened by a mission-style architect. Tillie’s, the smallest and only food source remaining in town. A dead radio station, with a dead restaurant to its left. The Roll-Inn, right on main Street. Half-a-dozen slots, full hookups, and WiFi if you stand right next to the “office”. $20/day, with no one on duty. The dumps make for more interesting photos, but there are plenty of these around. The I.O.O.F. 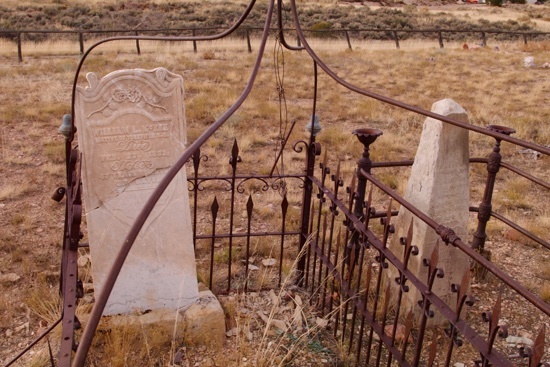 and Mason Cemetery, gated to keep out the riffraff like me. With no secular support nets whatsoever in a world fraught with risk, fraternal organizations often filled the role of building links, relationships, a political power base, and identity. William McKee, at left, came here from Yorkville, SC and died in 1882 at the ripe old age of 47. To right, the carving is too worn to read name or age, but a chiseled inscription below reads, “How full of light, how full of joy, Is buried with, Our daling boy.” That’s not my typo, but it hardly matters. 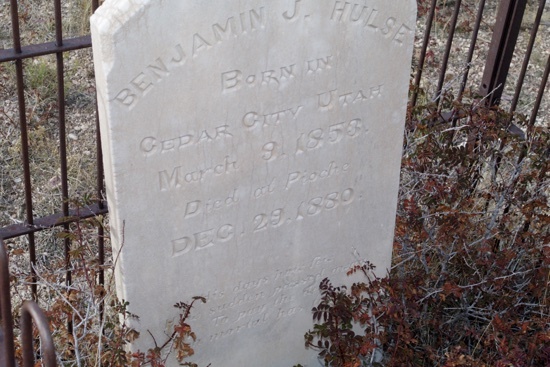 This fatalistic gravestone is for Benjamin F. Hulse, born in 1853 in Cedar City, Utah. 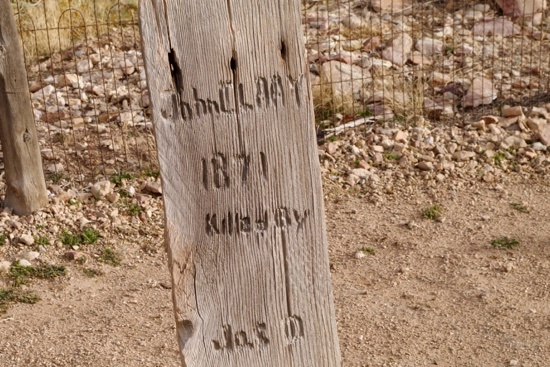 He died here in 1880. The inscription reads, “His days how few, How sudden passed away, To pay the debt, Each mortal has to pay”. 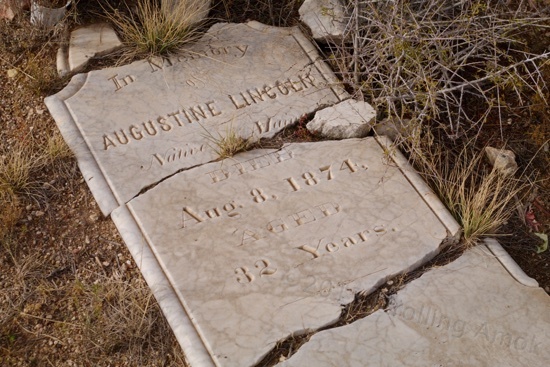 Augustine Lincoln came in from Maine and died here in 1874 at the age of 32. That age leads me to wordings about marital status and family, since out here, loss of the breadwinner could cascade misfortune among them. 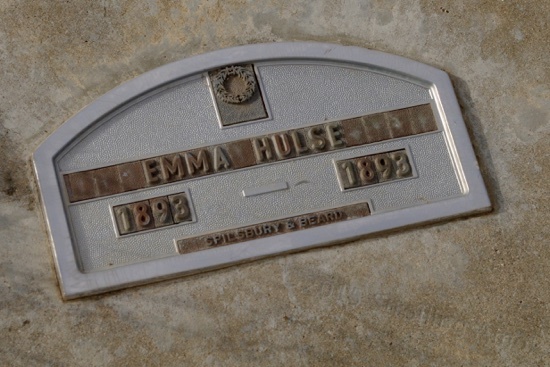 Whoever the Hulse family was, they suffered no end of grief. There were three similar markers in their row. And again, the Coles lost infants. 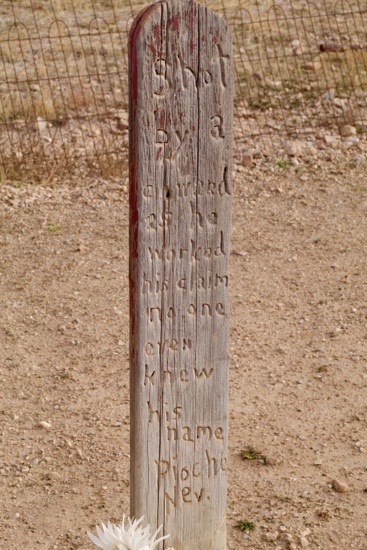 “Aged 17 days.” I had come across so many of these markers by this point that I could hardly deal with more, so I gravitated toward the solemn, long row of adults killed around 1870 along a fence line. 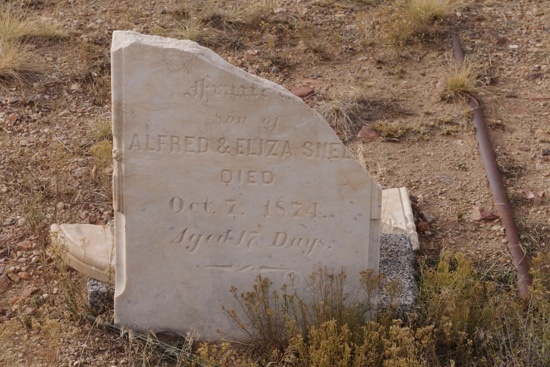 And one of the first markers I found there was “Baby Fenn”, who died in 1875 of cholera. 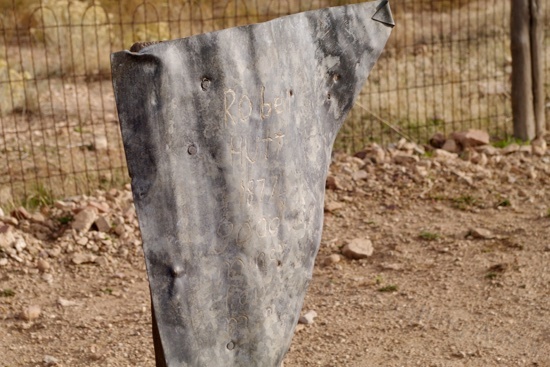 The interesting corrugated sheetmetal marker of Robert Hutt, a miner who died in 1872. 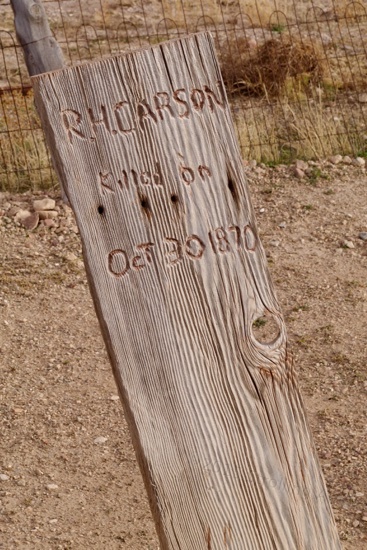 This was much more common along the row – the victim’s name, the year here being 1871, and the name of the killer. 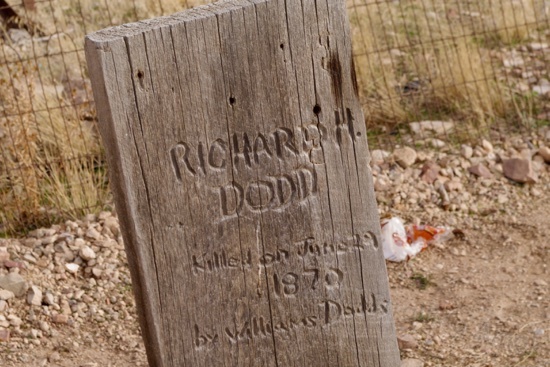 A Dodd killed by a Dodds in 1870. 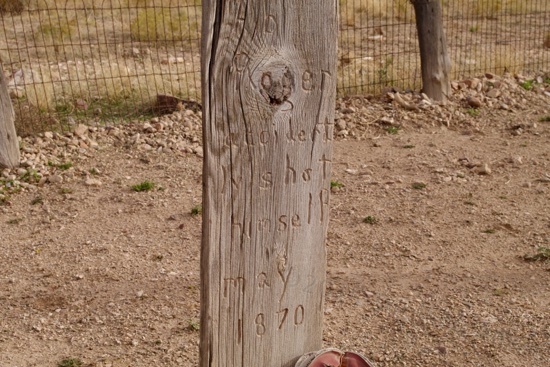 This gentleman accidentally shot himself in 1870. Morgan Courtney, 1844-1873. “Feared by some, Respected by few, Detested by others, Shot in back 5 times from ambush”. No mincing around here. I guess you can read this one yourself. This seems to not be the only marker with Mr. Maxwell’s handiwork below it. 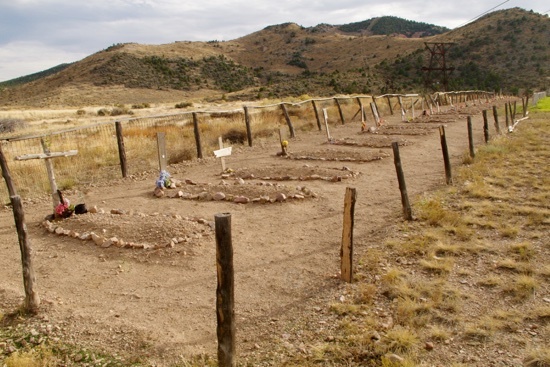 John Bass may have received his just deserts when he was “shot 5 times by officers” in 1870. Most pistols were small bore and without much oomph then, and gun battles often lasted quite awhile before the most aggrieved party went down for the count. 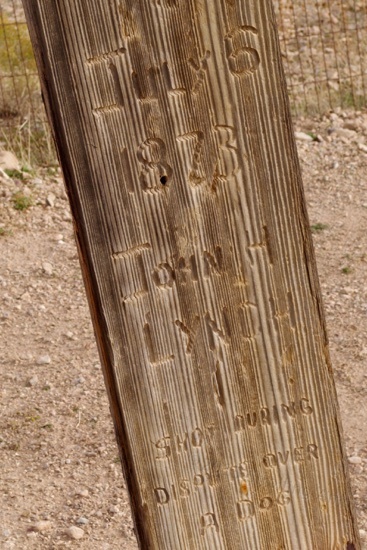 John Lyndh ended his days in 1873, “shot during dispute over a dog”. So we go from cholera to this. It looks like all those wood, nicely lined markers are new? Thanks for the guided tour of the town. I really enjoyed it. Where are you off to next? New, no. Replacements, possibly. I find it doubtful that the wood would have survived as well as it did. On the other hand, I notice that the “penmanship” shows one hand prior to 1873, and another from 1873 on. I don’t worry about it either way, as it’s at the town’s discretion to replace/recreate markers if they think it’s necessary to preserve identity. Glad you enjoyed the write-up, Cam. Next up on the menu is a skulk and run down to Parker, AZ for quick overnight, and on to an RV park in Wellton, near Yuma. The exploration-oriented articles won’t begin again until Spring. Well, I had a long response here, but I screwed up and it went away. Here’s the sum: Great post, Doug, fascination stuff, thank you. Thanks Dawn. Such posts take me a very long while to get out, and your thanks is (are?) appreciated. 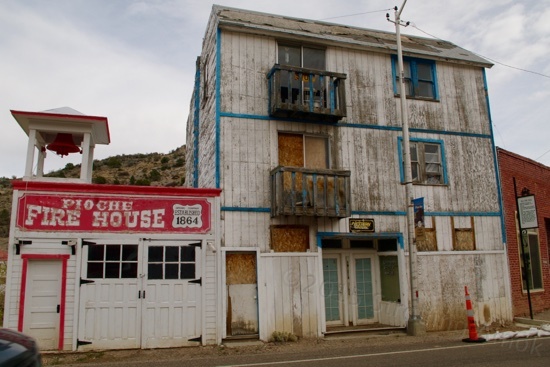 Reminds me SO much of Virginia City, NV, just west of Carson City. You been there? Nope, not yet! The Defiant has pretty much relegated me to Interstate commuting. Wow, grim and timely this spooky season, those murdered. Wonder why some have flowers? And I know what you mean about the babies’ graves, they died so frequently back then. Bad behavior itself needs no season, does it? Some flowers (plastic) are here and there from the descendants of relatives, I suspect. 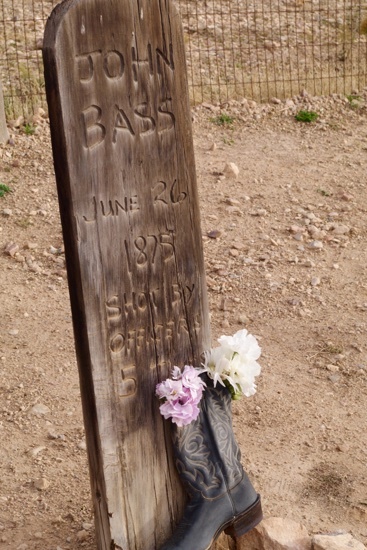 I think the city caretaker peppered “murder row” with both flowers and old cowboy boots on each marker, just to pump up the “historical attraction” effect. The mortality rate of infants in those times was particularly poor, and we like to think that they somehow just stoically accepted the inevitable and moved on to face the next hardship. But it ain’t so. Only the death and crippling rates have changed, not us. 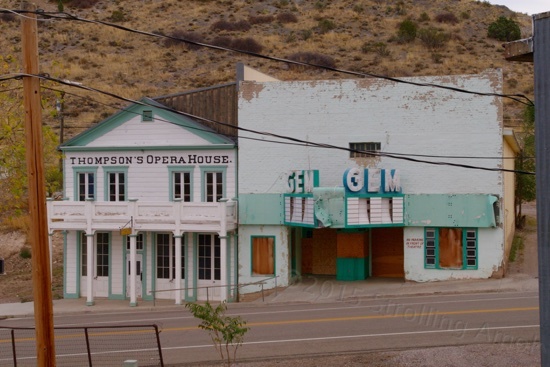 Ghost, or near ghost towns can be fascinating. This one had an interesting cemetery. It certainly gives a flavor for the dangerous times that existed here during the gold rush times. Thanks for the walk about! You’re welcome, KLB! Though I tend to “over-shoot” places instead of being concise, and fear that readers will then feel there’s no point in visiting a place themselves, I consistently find that being there and experiencing it is a different world from reading and looking at little flat pictures. There’s just no substitute for being there. Not even close. I really appreciated your insightful socioeconomic analysis, too, good stuff thare. Send it to Sunset or whatever, if it still exists, or to an online mag, readers will thank you. I’m not sure Pioche itself would be so thankful, seeing as how I’m relegating it to the “interesting but dying” category! Thanks for the high praise, Dawn. My goal wavers between doing something modestly expressive/creative, and learning what it takes to write engaging or helpful articles for people. I’m sure that trying to get published online would help blog exposure, but I’m taking this time to jump through my own hoops rather than try to jump through someone else’s. Once a blog gets popular enough, attitudes start getting wonky and the urge is to keep up the flurry and figure out how to monetize it, rather than be writing for oneself as one way to be creative. I need to be able to run the blog at my varying pace and scope of interest, rather than have it run me, and to be able to find my own voice without some internal drive nagging me to write what will “sell”, or homogenize the content, or sound one way while actually being another. I don’t consider myself to be a writer, since I can’t write about just anything assigned, and take way too many man-hours in coughing this stuff up. But I enjoy writing, so here it is. That some readers like you enjoy some of the end product or get something out of it is the unexpected plus. After all, it’s YOUR story, and you are not shaping your view based on market, or an editor’s, requirements. It’s entertaining. Period. I mean, it’s good!!!! Really good! I am a lifelong reader, and not one who is patient with poorly-written sophomoric crap. People beyond those of us here would enjoy it very much. But. However. I respect your statement: “My goal wavers between doing something modestly expressive/creative, and learning what it takes to write engaging or helpful articles for people.” This is sensible, and practical. I like it. I wanna try it–look out, you are inspiring a wanna-be writer! And it makes sense, for the reasons you stated, to keep this blog small. Ugh, the way people react/act-out online is pretty awful at times. The money-thing, too, warps better minds than mine when it comes to content, dulls it to appeal to the lowest common denom. I agree completely with your choice of running the blog in your own way. Stay true, cap’n! The more writers I talk to, or read about, the more encouraged I am, because, many times, they too find writing to be an amazingly time-consuming slog, a serious hunk of hard, slow work. I’m like that, and, sadly, I like to beat myself up over it. We are not alone! “Real” writers do it too! But thanks for inciting me to write! It’s fun, and I am terribly good at avoiding doing it. Hmm…you got me to write something. Must see how to use this event to write more. It was…well, I love your writing, and I disagreed with your assessment of yourself as not being a “real” writer, which got me fired up. I guess I just need to stick with subjects that get me fired up. We shall see…. Wow, you’re comin’ at me from every direction on that one! Thanks for the praise of my work. The other reason I think of myself as a person who likes to write, and not a “writer”, is that I cannot seem to write an outline to save my soul: things I want to get across, in logical order. I can begin one, but quickly get lost in it. I also cannot be concise. Both of these traits are reflected in most posts here. I write long posts that wander about. More to the point, I’d rather avoid the work it would take to correct that, and have little interest in hearing an editor say, “Holy mackerel, you could have written this whole thing in 1/10th the words!” I enjoy brevity as a spectator, but I do not participate in it. It immediately leaves me with the feeling that I chopped a lot of potential significance out and made a loaf of Wonder Bread when I had a taste for a 9-grain loaf that takes effort to slice. I start writing about my first thoughts on a place or thing, then read through it and that reminds me to include this or that, or provokes other thoughts. Add those in, let it soak, read it again. What did I miss? Rinse and repeat countless times. The process is a bloated mess, but when I’m satisfied with whatever’s there, out it goes. Best I can do, let it go. It’s done. Good enough for who it’s for: me. I do not advise using my writing as a resource to emulate in order to get literary recognition or to get published. Bad idea. What I ascribe to is the old-school attitude about doing things. Do them because you enjoy doing them, regardless of how brilliant or pathetic the results. The results are a distant priority to the enjoyment. Before the advent of recorded music, entertaining oneself and others with an instrument or singing was commonplace. Having an unusual talent for it was secondary – there was no need nor expectation of excellence. Just study, practice, and do your best. Not that excellence was not highly appreciated, nor playing the violin like a wounded chimpanzee not winced at, but average talent or skill was the realm of mortals, and was no excuse to give it up. The whole point was to discover that success at anything takes practice and perseverance. A life lesson. If you like to write, then write. Same for painting, music, anything creative. The attitude I find that has worked its way in to replace the old life lesson is: Unless you can excel at something or at least quickly show unusual promise, give it up and forget about it. Continuing on with it is pointless, because you’ll never be good enough at it to win fame or fortune and get on that TV show or win that recording contract. Enjoyment has nothing to do with it unless it is to enjoy success. Anything less is failure, and should be abandoned. What this has to do with enjoying the activity itself is such a huge disjoint for me that it’s offensive in a way, and kind of horrifying. We’re now so bombarded by the exceptional that nothing else will do, and any effort is ridiculed by people who are afraid to even try. Even in my day, taking up an instrument as a kid was expected, if the means existed. Now, the fear of being average drives out the thought of trying. New life lesson: persevering with anything is a waste of time, and delays success in something else. Too bad, if you would have enjoyed it anyway, since it doesn’t put you above the crowd. It’s either exceptional, or worthless. So I write because I get pleasure from it, and I’ll continue to do so until I don’t, or I can’t anymore. I don’t see it as a vehicle to get somewhere that I have no desire to go, nor do I feel the least desire to have to once again deal with gatekeepers of any stripe. No need to. If you enjoy writing, then do it. I can’t seem to refrain from writing, so your avoiding doing it or distracting yourself away from it is puzzling. Don’t allow “beauty culture” attitudes to dampen or threaten your efforts, or you’ll understandably want escape. You really can’t be fearful or overly critical or make fun of of yourself until you’ve written out enough that you can afford that luxury. I’d say stay away from gatekeepers, the desire to “get published”, or anything else that sets up standards to be met or hoops to jump through. Write as an expression of who you are, and because both the challenging process and the end result please you personally, not your friends or those writer’s forum buddies who might be pushing you as a newbie to hit one out of the park. Try to avoid being hemmed in by artsy writer’s jargon until you get to the stage where you’re concerned about the mechanics. Whatever inspires and energizes you to write and improve your work is good. Any sounding board that replaces sheer enjoyment with success potential or competency will tend to choke off your desire to write – unless you are determined to make a living at it. Write first, become a writer sometime later, and take a shot for the trophy way after that, if that’s why you are driven to write. Should have made this a blog post, fer cry-eye. Look at it this way. I know of a guy who likes to photograph nature, and he decided to study and practice enough that he could produce photographs identical to those on postcards and in travel books, those color-rich “standard shots” we all like to “Oooo” at. That took a heap of work in learning techniques and software editing, and actually, taking the shot itself is no picnic. His photos are now virtually indistinguishable from pro “nature photographer” work. But that’s the problem. Though it’s at a very high level, it’s just more of the same. There’s no “him” in it, bringing something unique to the table. He could easily make a living at it, though he’d need the aggressive networking and so on to push past the others who already supply the exact same thing. Fortunately, he does all this for his own pleasure, but his pleasure is to precisely duplicate what others in the field have long since beaten to death. My fear is that he will decide to stop there, and remain satisfied with mimicking. The moral: Find your own voice. Developing skills is relatively easy, and like the needed tools, can be purchased. What is of real value, and so much harder to acquire, is developing a competent style that works, but also reflects your approach to your work and of seeing the world. If I ever went to an online writers forum, I assume that would be the kind of thing I’d read. Maybe not. What do I know? I don’t have a “craft” to hone. I just write, and provoke my little measure of suffering among the literate. Life is good. Doug. I came back here just now for one reason: to ap0logize for being so long-winded on your blog. I forgot that this is not like a Yahoo Groups book club, where every member has equal rights to blather on at will. And now look at what you’ve done: Replied to me with your thoughts, which I very much want to respond to. Do you have access to my email address? If so, shoot me an email if you’d like. Or, I don’t mind posting it here for you if you wish. I feel I need your permission to take up so much blog space, and your other readers my not appreciate me talking so much, and off-topic at that. wow, detailed post! Thank you for spending the time that it took to put it together. The cemetery tour is especially fascinating as I’ve never explored small town cemeteries before. I’ll keep it in mind in the future. I was away camping and missed the solar solutions post when it first came out. I would have suggested hanging lightweight panels off the side like you do now on your present rig too. If it works well for you, I may try it for myself in the future! When do you get delivery of your Intrepid? Can you refresh my memory of what that vessel was in the ST universe? If you downsize any further, you’ll have to name your rigs after the shuttles! Thank you, Ming. 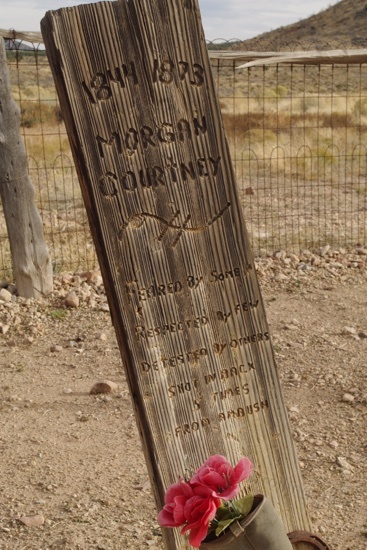 The Pioneer Cemetery at Grand Canyon is a great one too, as I described in an earlier post. Actually, the act of hanging panels is what I’m trying hard to get away from! They tend to present storage space issues, but when they’re hanging out there, they need to be both held up and lashed down securely. Otherwise, a stout wind makes them try to go away. I had one partially dismount itself during a windstorm in near the Bonneville Salt Flats last year, bending some hardware. Tough to beat as an efficient “set and forget” system for long-term stays, and less of a securing problem than angled ground panels, but they need to be lowered and lashed in truly high gales. If I downsize any further, I’ll be on them instead of in them! Exploration? That’s good enough for me, although, depending on what I have for dinner on any given day, the Intrepid might be the one emanating poisonous energies. Thanks, Ming. Doug what a great post. I visited a few years ago and this is still one of my favorite little towns. I took some photos of the old play house and a few other buildings and my view finder had crazy streaks and hazy spots. The photos turned out nust fine. I was talking to a young lady at the gas station and told ner I knew which buildings were hunted……she seemed shocked when I named the buildings she though were hunted. Thanks for all the effort on this one. Interesting account, Papa, and thanks for the kudos. Glad you enjoyed it. Nice writeup and one of the many reasons I hope to fulltime someday. 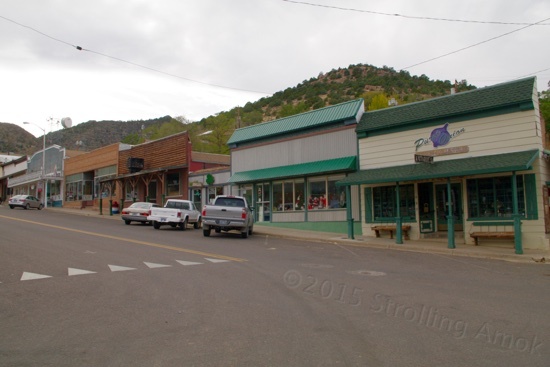 I’m sure the West is littered with towns just like Pioche. I’m curious how you were able to find out some of the history of the town and its buildings. Are there many old-time residents? I’ve enjoyed listening to a few over the years tell their stories, and some colorful characters to boot. As a Coloradan, the mines have largely been played out over the decades (long before the EPA), but I can assure you we take our water very seriously. There is public outcry, such as with the Animas river, but it doesn’t get much press. Western Slope communities, for example, have been successful in bringing attention to the dangers of fracking, There’s been a real fight between the state (and drilling companies) and local control. You’re right about the hit to the economy. Our natural resource exploitation comes mainly from oil and natural gas these days, and contributes a fair amount to state coffers. Our governor is painfully aware of this as he attempts to walk a fine line between preserving our state’s natural beauty while actively lobbying for keeping control of fracking laws firmly in Denver. He’s what we call a Western Democrat. Enough of the tangent. 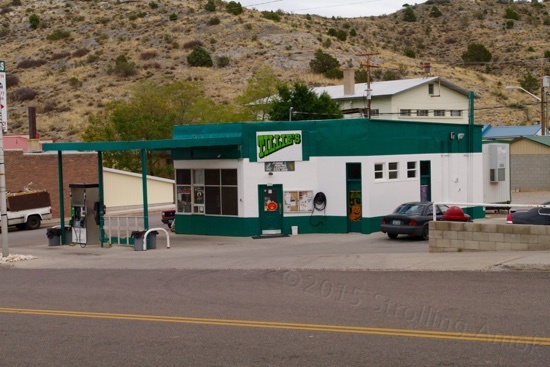 Thanks for sharing your Pioche experience. A well thought-out post, as always. Glad you enjoyed it, Jim. There is informative signage throughout the town and, as I like to say, “Google is your friend” for the rest. Pioche seems to be heavily populated with people who have been there quite awhile, since it’s remote enough that people don’t just flit about as they do elsewhere. It takes a certain amount of determination to stick with the place. But, I was not in a position to be able to spend the time needed to seek out and interview people. It concerns me that the media does so minimal a job in covering the issues, as if they are operating under some mandate to not rock the boat. Fracking is a major concern of mine too, since it is essentially a poison cocktail injected into underground water supplies and legally can’t be touched by the EPA. Thanks for explaining the tensions going on there. 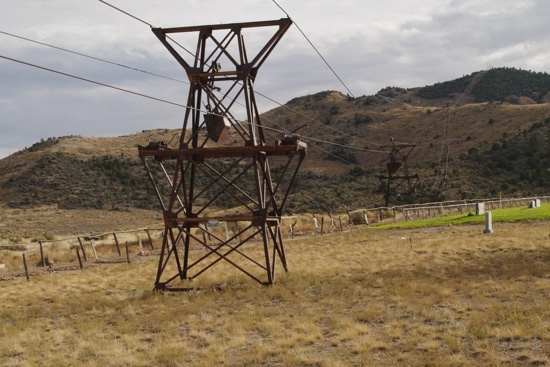 Towns like Silverton are still dealing with mines closed decades ago, while agricultural communities in both western and eastern parts of the state deal with today’s hydraulic fracturing. Poison cocktail is right: It’s the latest abuse of our life resource. And by the time the effects are felt, fly-by-night drilling companies will be long gone. Unfortunately, the mainstream media is increasingly owned or associated with the same interests which profit from these activities. 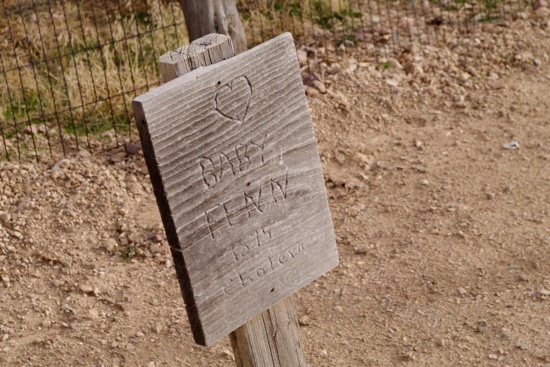 And as one not to leave a tangent alone… dating back to the late 19th century, Colorado began a long-lasting struggle with water and who gets to use it. Along with the Colorado River Compact, several architectural feats affected water from several of our big rivers; the Colorado, Gunnison, South Platte and the Arkansas. If you’re interested, look up the Colorado Big Thompson project, Moffatt Tunnel, Gunnison Tunnel, and the Fryingpan Arkansas River project. There’s also a good PBS documentary called “The Great Divide”, which talks about all of these and more. And at risk of even another tangent, the Western Rivers Institute website has some good reading. What worries me is; how will the ever-growing demand for a diminishing resource undermine the current water-sharing detente, and return us to the water wars of the early 20th century, with 21st century interests at stake. I will look those up, thank you very much. I’m tending to learn that the slant that the media takes is usually not the real story. It’s propaganda designed to steer the 98% into giving up what little rights they have left, with a whimper, being led to believe that it’s the best possible thing to do. It is – for the 2% – since the power of effective protest is removed by their own assent. As for water, I suspect that the only real wars will be between competing corporate interests, all claiming to represent the people’s interests, too. Fracking has already demonstrated that the maladies caused to people and livestock are considered to be of no real value when it comes to making profits. Money talks, so that pattern should continue when getting any water at all becomes the issue. Whoever wins the interesting battle over water, it will be “interests”, not families. I’m hoping it will turn out to be better than I think.